The Global Optical sensors market is growing rapidly across various countries due to the increase in the demand for smart phones and tablets. The market recorded revenue of $25.65billion in 2017 and is estimated to grow at a CAGR of 8.99% throughout the forecast period 2018-2023. The growth is exclusively due to the increasing emphasis on building automation along with rising demand from the automotive, industrial, consumer electronics and defense industries where the government regulations surrounding safety have been increasing the deployment of these sensors thereby augmenting the market growth. Image sensors segment has dominated the optical sensors market by collecting annual revenue of approximately $14billion in 2017 and is projected to grow at a CAGR of 9.70% throughout the forecast period. Asia-Pacific region dominated the market with the contribution of $9.50billion in 2017 and is estimated to grow steadily at a CAGR of 10.46% during the forecast period owing to the increasing number of manufacturing and processing industries coupled with the increasing automation rate especially in the countries like India, China, Japan and South Korea. The increasing adoption of automation across diverse sectors such as manufacturing, aerospace and defense, oil and gas is driving the growth of the global optical sensors market rapidly. Moreover, optical sensors possess various benefits such as flexibility, compactness and lightweight owing to the adoption of these devices in the end user industries. What are the major applications for Optical Sensors? The applications for optical sensors include Ambient Light Sensor which is mostly seen on mobile phones. It enhances easy to view display which is optimized by the environment and extends battery life. Other applications include Fiber optic sensor, Opto sensor, Ultrasonic sensor, Temperature sensor, Liquid level indicator, Pressure, Humidity, Rotation, pH level indicator, Displacement (position) and many more. The end users include Aerospace and Defense, Building Automation, Consumer Electronics, Manufacturing, Office Equipment, Security & Surveillance, Wireless Communications and more. Recent study indicates that the US military researchers are working with few companies in developing technologies for future light detection and ranging (LIDAR) electro optical sensor systems. Modular Optical Aperture Building Blocks (MOABB) intend to develop enabling technologies for a small lightweight electro-optical sensor using free space optical technology with ultra-low size, weight and cost with faster beam scanning speeds. These kind of optical sensors are mainly used in Aerospace and Defense. The market growth for Aerospace and Defense depends on economics, politics and government regulations. Due to the dramatic growth of US market in this sector, the optical sensors industry is going to benefit and estimated to generate huge revenue and will have great impact in the future. The latest development in the industry is the use of optical sensors in autonomous cars, in order to keep an eye on surroundings. The optical sensors based on LEDs and infrared lasers are one of the key technologies for advanced driver assistance systems to gradually reduce the burden on the driver. These sensors are mainly used in the driver assistant systems as the Parking assistant, Lane Keeping assistant, Stop and Go assistant or Emergency brake assistant. The application of optical sensors in automotive industry is considerably growing especially with the usage of image sensors due to the advancement of technology. The image sensors market in automotive industry is estimated to grow rapidly due to its extensive image applications in the automotive sector. The recent development in chemical industry is the usage of fiber optical chemical sensors for the detection of harmful chemicals. The sensor uses optical fiber as the identifying element or as a means of relaying signals from a remote sensor to the extrinsic sensor. These kind of sensors has numerous applications such as clinical, organic, inorganic, environmental and biomedical analysis, industrial production and bioprocess control, which involves an intrinsic color or fluorescence. Other applications include, measuring petroleum constituents, benzene, xylenes and toluene. The use of fiber optical chemical sensor in the chemical industry can drive the market rapidly in the future, and also due to the availability of low cost, miniature opto electric sources. 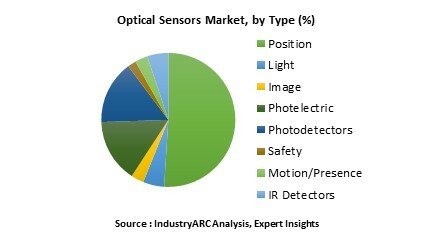 Who are the Major Players in Optical Sensors market? The companies referred to in the market research report includes Hamamatsu Photonics K.K. Baumer Electric Ag, Sofradir Ec Inc., Vigo System S.A., Carlo Gavazzi Automation Spa, Teledyne Dalsa, Aptina Imaging and more than 25 companies.